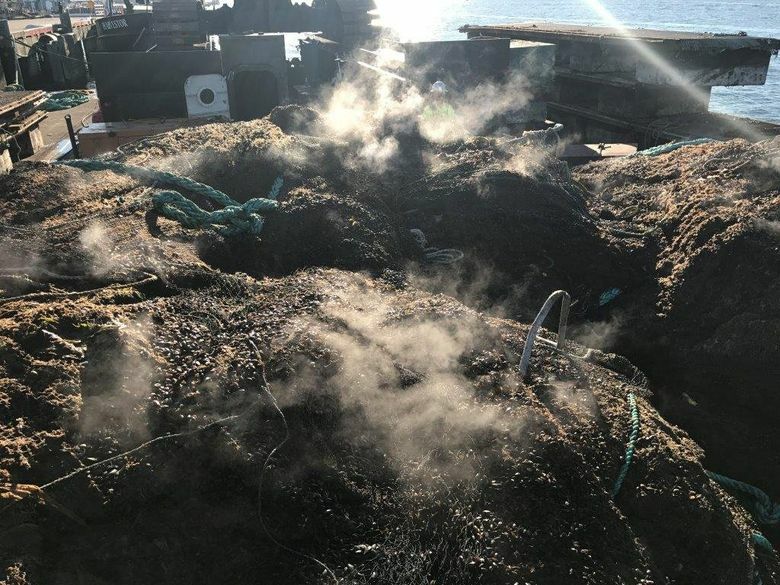 Cooke Aquaculture’s maintenance practices at its collapsed Atlantic salmon farm at Cypress Island have drawn the attention of state investigators after nets were found fouled with mussels and other sea life. 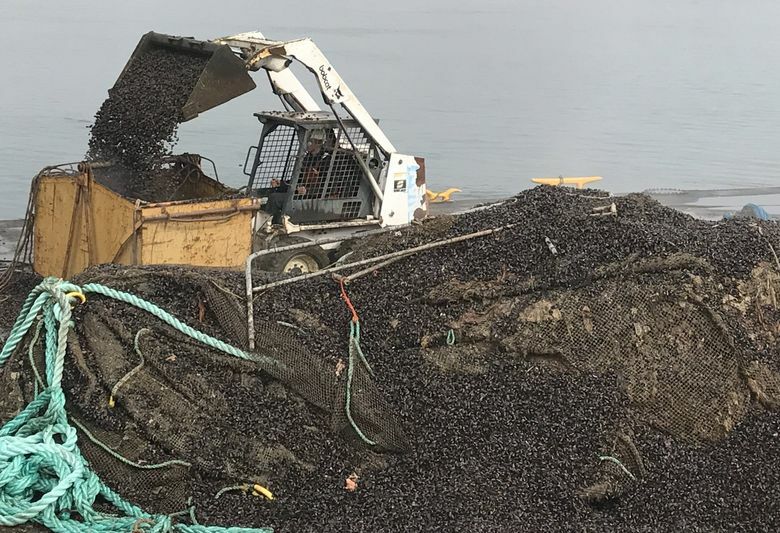 Investigators probing the collapse of an Atlantic salmon farm that sent 160,000 invasive fish into the Salish Sea last summer are examining mussels and other sea life coating the nets as a cause. Photographs obtained by The Seattle Times under a public-records request show portions of the nets at Cooke Aquaculture’s fish farm in Skagit County were so fouled with kelp, algae and especially mussels that the net was no longer visible. 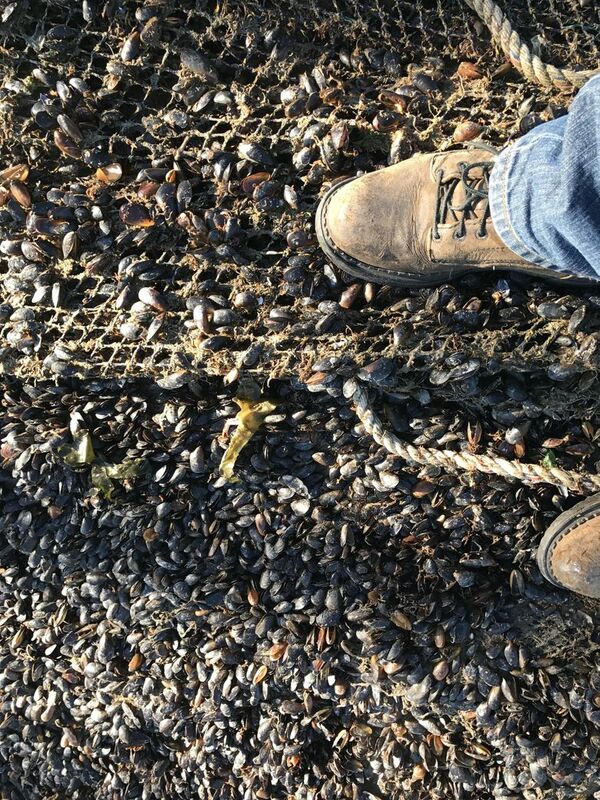 Mussels rained down on the dock as the nets were lifted with a crane for disposal, photos show. Heaps of mussels on the dock were so high, they had to be scooped up with a front-end loader. Cooke is required, under the terms of its lease with the state, to maintain its farms in a clean and safe condition. And Cooke had long known it needed to tackle the problem of drag at the farm, one of three it owns at Cypress Island. The farm faced against the current instead of with it, like the other two. The company planned to reposition the farm to lessen the forces of drag on the structure that it already had identified as its top priority for replacement because of metal fatigue and corrosion. But first, it wanted to take its harvest, scheduled in September, of about 3 million pounds of Atlantic salmon in the nets — some 305,000 fish in all. Keeping the nets clean is important because fouling changes the way they behave underwater in tidal currents. A net creates drag in the water as current is impeded by its webbing. Any sea life or other material that covers and clogs the webbing adds to that drag, said Parker MacCready, professor of oceanography at the University of Washington. Ultimately, he said, a net can so impede the flow of water that it acts like a sea anchor — and even a wall. The bigger the blockage, and more the current, the greater the drag. “Drag is real, drag matters,” said Jim Thomson, senior principal oceanographer and a fluid-mechanics expert at the Applied Physics Lab at the University of Washington. Notes obtained by The Seattle Times, which were written by state investigators from their interviews with Cooke employees after the incident, show employees confirmed that two of three machines used to clean the nets were out of service and being repaired, reducing the ability to keep up with biofouling, a problem that intensifies in the summer. The structure itself, in Cooke’s judgment, also suffered corrosion and metal fatigue and was at the end of its useful life. State investigators focused early on the issue of fouling as hunks of the destroyed fish farm were hauled to the surface after the collapse. For evidence, investigators cut off and preserved chunks of net covered in mussels. 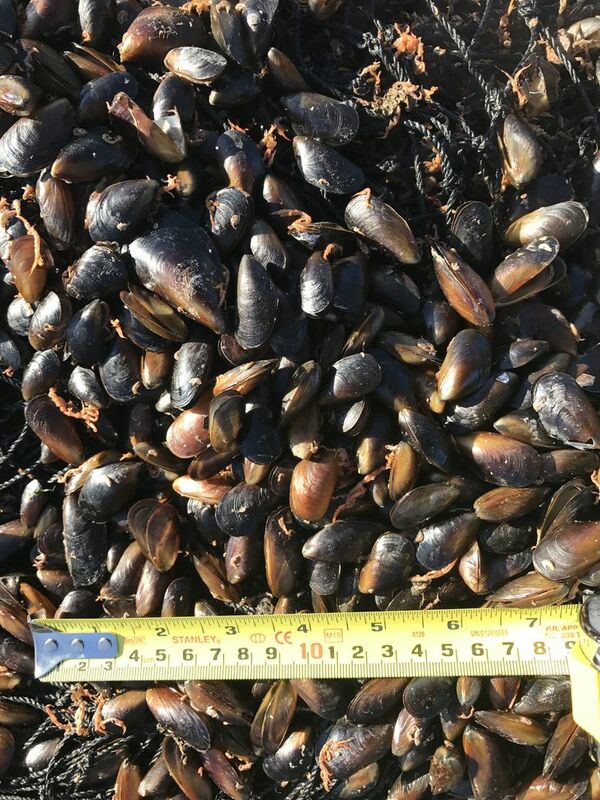 Brian MacDonald, at the Washington Department of Fish and Wildlife, advised Clark to weigh representative samples of the mussels to determine the wet weight the animals would have added on the nets. The company’s Cypress Island farm consists of three sites, each with nets in multiple cages filled with Atlantic salmon, accessed with walkways between the cages. The three float in open water, anchored to the sea floor to keep them within the boundaries leased by Cooke from the State Department of Natural Resources. In addition to probing the cause of the escape with other state agencies, DNR also is assessing whether Cooke is maintaining its sites at Cypress Island in good order and repair, in a clean, attractive and safe condition, as required by the state’s lease. If not, the agency can cancel the company’s lease — as it did in December at the company’s farm in Port Angeles, a termination the company is fighting in court. The mussels on the Site 2 nets were estimated to be 6 to 9 months old by Fish and Wildlife staff, emails obtained by The Times show. That, for investigators, also raised the question of adequate maintenance by Cooke. With just one working net-cleaning machine left, employees tried other means. Innes Weir, Cooke’s general manager in Washington, told investigators that employees continued cleaning the nets by lifting them and sucking kelp off using a vacuum device. The company brought in equipment from its other farms and got the nets 80 percent clean. “Staff are aware of the problems caused by fouling,” he told investigators. Still, if fouling is scored on a scale of 1 to 10, with 2-3 being ideal, it was probably more like 8 after July, Guthrie told investigators, according to their notes. Employees’ interviews also shed new light on not only the seriousness of the first trouble at Site 2, which broke half its mooring lines in July and started to drift, but the mayhem of the total collapse less than a month later. Guthrie recognized an emergency was happening and called in managers from around the company. “Arrived on site, observed extensive damage, Site 2 moving toward Site 1,” investigators recorded Guthrie as recounting. “Very dynamic … Flood tide, north side and shore side anchors failed either broken or drug, moving south/southwest toward Site 1. Guthrie deemed the farm too unsafe for staff to board. And over the next couple of days, “things got worse.” Top priority for Cooke, as the disaster unfolded, was keeping the failing farm from careening into its Site 1 farm, also full of fish. Meanwhile, the state Legislature is considering several bills to phase out, or immediately terminate, Cooke’s operations in Washington. Leaders from 21 Washington tribes also sent a letter to every state lawmaker on Jan. 18 requesting that Atlantic salmon open-water net-pen farming be shut down in Washington as soon as possible to protect native salmon in Puget Sound. Cooke has hired lobbyists, spokespeople and lawyers to defend its operations, the 181 jobs the company sustains in Washington, and its investment in the farms. The company has invested more than $70 million in the farms and intends to upgrade and expand its operations, Cooke executives have told legislators in hearings convened to consider phasing out or shutting down their operations. Sen. Kevin Ranker, D-Orcas Island, and a co-sponsor of the bill to phase out Atlantic salmon net pen farming, said Cooke’s leases at the Cypress Island farms should be reviewed for termination by Hilary Franz, commissioner of public lands, because of poor maintenance.